Diane was the first child born of the union between Don Schmidt and Patricia Phillips and spent her first years in the family’s first house, great grandmother Jane Snider’s home at 4694 Dry Creek Rd. Brian followed three years later while the family was still in Grandma Snider’s house and Kay was born one year later. All three kids went to elementary school in Geyserville, until the school district lines were redrawn and they happily moved into Healdsburg Elementary School. They progressed through Junior High and then into Healdsburg High School. 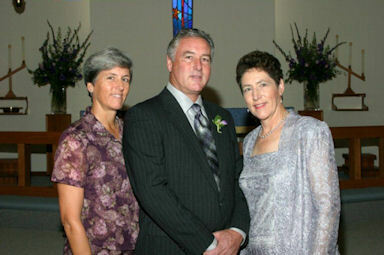 All three were active in 4H, raising sheep, as well as participating in sports. During their childhood, both prunes and grapes were being grown. 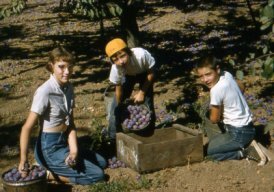 Prunes were so important to the local economy that school schedule did not start until harvest was complete. All the kids picked prunes and helped in their own prune dehydrator. Prunes were picked by hand initially until a mechanical harvester was purchased in 1963. Their prune dehydrator had been built by their father and the mechanical design of the processing equipment designed by him also. In the early 1970’s most of the prune orchards were replanted to winegrapes. Since the family had always had winegrapes, this was an easy transition. The family at that time grew Zinfandel, Petite sirah, Cabernet, Merlot and Riesling. The kids spent their after college years marrying, having their own children and following their own career paths. One by one, they returned to the ranch. In the mid-1990’s, Brian and and his wife Janice were managing the vineyard and began to replant as blocks reached 20 years of age. The vineyard now grows Malbec and Petit Verdot along with Cabernet and Merlot, Petite sirah and Zinfandel as well as the white varieties Chardonnay, Sauvignon blanc and Viognier that were added in 2006. Our winegrapes are sold to area wineries as well as a dedicated group of homewinemakers.